This Standard Scrambling Pack from DMM is a great way to ensure you have what you need to develop your mountain skills and improve your scrambling grades. All you need to add is your knowledge, experience, a helmet and a harness and you'll be ready to tackle some, perhaps more interesting scrambles. The pack has been developed in conjuction with the Association of Mountaineering Instructors to help you make the most of the mountains. The Wallnuts provide lightweight and versatile protection for when you need to rope up, build a belay or climb a pitch and these are racked on the Aero straight gate karabiner which has a clean nose to prevent snagging. The quickdraws are highly versatile and allow you to extend placements to reduce rope drag on wandering lines, the slings also let you use naturally occuring anchors as protection. 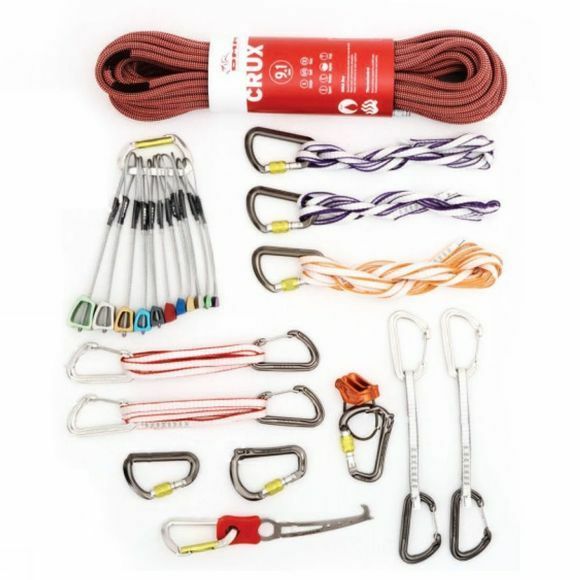 The Crux rope is dry treated to ensure it stays lightweight and supple in wet or cold weather making it an ideal scrambling rope and the Mantis belay plate and Rhino karabiner set ensures you have a high performance device that'll give you all the confidence you need on abseils and belays. Spare karabiners are great for keeping kit to hand and a Nutbuster is provided as an invaluable tool to help you retrieve tools placed by the lead.